Rowley justified his Government’s actions over the past three years, even referencing State-sector retrenchment that he has been criticised for. “Since I am a little boy, I know that if you are in a hole the first thing you have to do is stop digging,” he said to encapsulate his administration’s approach to debt. Using charts, he traced how TT’s energy revenues had plummeted. “In 2014 we were earning $17 billion dollars from energy sector; By 2016 it was $1 billion.” He blamed the fall on three things - the collapse of oil price from US$90 down to $47, even once reaching a mere US$28. At the same time the volume of oil produced fell by 10 percent. Likewise the price of natural gas fell, even as the volume produced fell by 20 per cent. Rowley alleged the third thing causing losses in 2014 was the former government’s concessions to gas companies that whatever they invested in an oil/gas well they could write off in taxes. He compared TT to Nigeria. Nigeria got $3.6 billion in taxes paid by oil firms to the government from $6.8 billion worth of oil produced, or 53 per cent. For almost the same gross production, TT got just $31 million in taxes, or one per cent of the value, he lamented, blaming tax-breaks by the former government. The PM said the Government has begun fresh talks with energy firms on this. He accused the former government of unduly increasing spending in 2011, 2012 and 2013, from the usual $43 billion per year up to $60 billion. The PM lamented that in 2015 despite a collapse in energy volume and energy prices, the former government had a “spike” in spending ahead of the general election. In contrast, his Government had reined in spending, such as by saving a projected quarter billion dollars over five years by cutting the Cabinet size. Rowley said spending cuts had to be done over time, slowly and carefully, while trying to keep jobs. He said IMF had said the Government’s measures were laudably expected to bring a two percent growth in the economy. He said from 2010 to 2014, each year spending had exceeded revenue, so incurring deficits. Hitting the former government for having spent all it had earned and then borrowing more to spent it all, the PM hit the Opposition for now offering advice to him. Rowley noted the anomaly of a small sum being borrowed in 2015, despite a big spike in spending in 2015. He matched up the figures by alleging “secret borrowing” by the former government. Rowley said the Opposition was now wrong to criticise his Government which really had needed to borrow to run the country. “We are going in the right direction reducing the amount of borrowing.” He want this to create economic growth so as to produce revenues for a good standard of living. 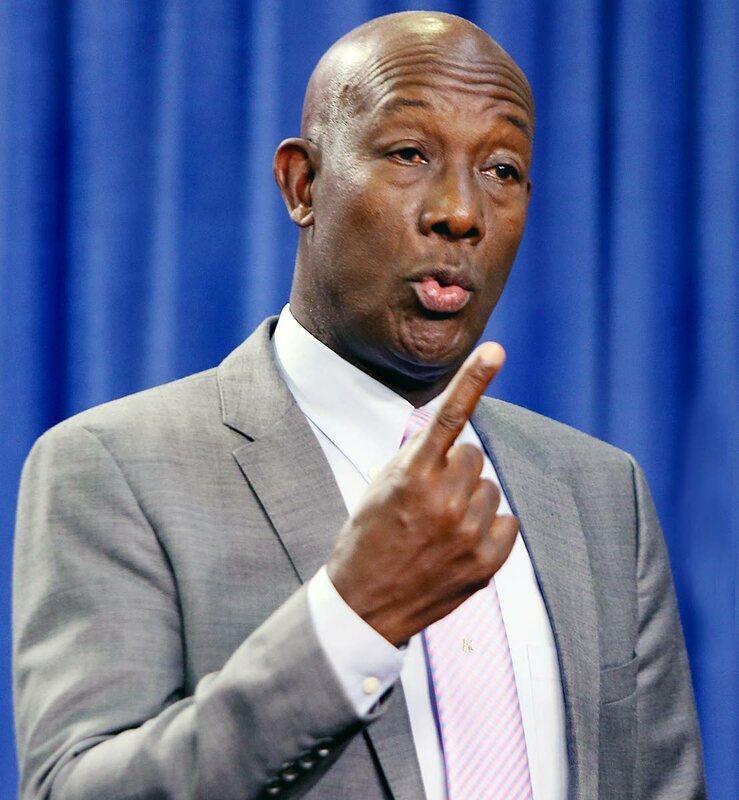 He said never before did a Government spend the NGC’s money, but the former government had raided the account four times.Rowley recalled the then Central Bank governor said the government had cash to run the country for only three days. While it had once cost $170 million per day to run the country, his Government has reduced that to $140 million per day. While jobs may be lost, he has avoided bankrupting the country, while letting the country survive sustainably. Rowley listed what the $29 billion could have done. He knew the main tower in POSGH was assessed an unsafe in 2009, and he was glad it did not collapse in the recent earthquake. It could be fixed for $2 billion. Some $850 million could build a new Sangre Grande Hospital. He expected to put up about $1 billion for a pipeline to access Venezuelan gas from the Dragon field. To build a La Brea dry dock to diversify the economy would cost the Government $2 billion. A big tourism project in Tobago could cost $1 billion, while Tobago needs an airport upgrade costing say $1 billion. To buy two new ferries would cost $1 billion, he said, while the San Fernando Waterfront could be developed for an initial $1 billion. To protect TT”s borders from gun-runners, he’d buy two new vessels for $600 million. He proposed $2 billion to build public housing. The sum of all his proposals would amount to less than half of the money burnt up by the former regime, said Rowley. He said agreements are under way for the new hospitals, pipeline, dry dock. Regarding a tourism project for Tobago, he lamented, “I’m expecting we would have chased away what would have been good for us. “Tobago is the only place in the Caribbean we here a Sandals project would bring leprosy,” he scoffed, listing about seven Caribbean nations with Sandals hotels. He said people had opposed it for political reasons. The Government paid for two ferries, being built by Austal and Incat. Some $40 million was paid towards two new Coast Guard vessels. Rowley listed some past Government debts. He said the EMBD burnt up $400 million by the former government just before the 2015 election. CAL ate up $510 million in a year. However CAL is now making a profit, he said, invoking applause. He said the National Carnival Commission (NCC) borrowed $75 million to be re-paid within a year. Rowley said he had asked the Australian PM to fund TT’s boat buying. He said the TT Opposition asked the Australian Opposition to help scotch the deal, but were rightly ignored. He said the Opposition had asked the Australian attorney general to investigate but this was refused. “Somehow those who have to explain what they did with $29 billion, could tell you there is scandal,” he scoffed. He listed more debts incurred by the former regime including $300 million for Housing Development Corporation and $57 million for Public Transport Service Corporation. Some $4 billion in total had been due to be re-paid almost immediately, he related. “On the way out of office they gave public servants $5 billion in back-pay. It was a contract.” His Government had to borrow this $5 billion in two tranches to pay this debt. He broke down the spending of every $100 in revenues now earned. The first item was $18 to repay public debt. Wages, salaries and pensions was $50. Social services was $9. Infrastructure was $10. Everything else not listed costs $13. Referring to these heads, he said 3,000 workers in Barbados were retrenched, and that TT offers the best social services of many places. Rowley reasoned it is unfair to say his Government is doing nothing. Part Two of his address is due today (Monday) at 8pm. Reply to "PM lifts TT out of hole"